Chassis modifications for roll cage fitment? Are there any 'standard' or common chassis modifications required when fitting a roll cage? I'm thinking along the lines of beefed up or gusseted mounting ponts for the cage. Also, am I correct in thinking that to be MSA compliant the seat mounts need to be tied into the chassis via a couple of aditional out-riggers? I'd say a plate across the top of the rear end, above where the rear seats end and the petrol tank starts, but others will know better than me. I can’t see a reg that says the seat must be mounted to the chassis, but it makes a lot of sense. The cage feet will depend on design - are you keeping the dash and rear seats for example (which may be dictated by the regs for the class you’re competing in). I intend to use the car for hill-climbs, track days and whatever else takes my fancy. I am not building it to suite a particular class or competition as I am changing the engine for something more modern making it invalid for a lot of classes and droping me into 'sports libre' (well, as far as I can make out anyway). I wan't to fit a cage to protect me from my lack of talent. If I am paying for a cage I want one that will be legal for use in motorsport. The car has no rear seats but I would like to retain as much of the original dashboard as possible as I feel it is a large part of the cars character. If a traditional 6 point cage is what you intend? Then (with dash still fitted) the front legs land into nothing much. So some bracing between the main chassis rails and outrigger is needed. At the same time do the same for your seat mounts. The main roll hoop will need extension boxes onto the chassis tubes. The rears normally mount straight to the chassis at the point the floor rises up and becomes the boot floor (the back edge of the rear seats). 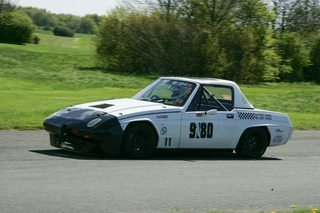 When my car was road legal and driven to events I had a normal lap belt fitted to the roll cage too, as it made normal driving a lot easier. Thanks, a six-point was what I was leaning towards. So long as I have space to fit in it. I am 6'2" and head room is a bit limited without a cage. I have a pair of MX5 seats to go in (original were long gone, replaced with some unknown worn out seats) and will look into lowering the floor to try to gain a little more. I'm just a little concerned of driving it on the road without a helmet and banging my head open on the cage bars if I get hit by something. Based on my memory and his signature block, I’m guessing a V6 Jag lump? You will also need a National A Licence. You will need to complete about 6 events as a B licence before you can get an A (unless things have changed). This is the price you pay to compete in a car with a different engine. And yet someone can rock up in a brand new Boxster S and compete in "classic marques"
Boxster S ,can complete in Roadgoing, No significant car mods required. Smiler we are a bit off topic here but if you want to compete in your GTE with a non standard engine YOU WILL be in Libre and you WILL need an A licence.